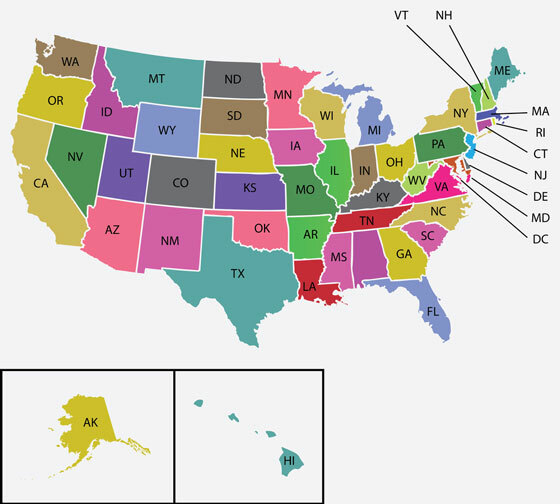 State maps of the 50 states in the United States of America are the focus of the State-Maps.org website, which offers convenient links to printable state maps plus reference and travel information for each state. To access the maps and information, visitors can either click on the name of a state or click on the state itself in the full U.S. map. On each of the state map websites in this state map directory, visitors will find scrollable road maps as well as topographical maps and relief maps. Visitors will also find detailed state maps and regional state maps. These large maps display cities, roads, rivers, and lakes as well as terrain features. The detailed state maps show individual states; they range in size from about 100 kilobytes to 800 kilobytes. The regional state maps show individual states and their surroundings; they range in size from 400 kilobytes to 1.6 megabytes. All information on website State-Maps.org is provided "as is." This website contains informational articles and resource links about United States road maps, topo maps, and relief maps. By using this website, you agree that Zeducorp is not responsible for errors or omissions, and shall have no liability for damages of any kind arising out of or resulting from any information, product, or service made available hereunder or the use or modification thereof. State-Maps.org is a Chosen Sites™ resource.